A quick and easy three ingredient meal for an easy dinner. This Low Carb Buttery Bacon and Cabbage Stir Fry will satisfy the taste buds and hit the spot with its high-fat content, full of flavor and low carb goodness. Dice bacon and add to frying pan on medium heat, along with half of butter. Saute bacon until crisp. 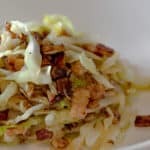 Add shredded cabbage to bacon and stir well to ensure the cabbage is coated in the pan juices. Add the other half of butter to pan along with a pinch of pepper and cook until cabbage is becoming translucent. Taste to adjust seasonings and serve. You may not wish to add any salt, depending on the saltiness of the bacon used.